Peppers fall into two primary categories, generally called “sweet“ (or, wrongly, bell) and hot. Peppers classified as “sweet“ have been found to be a genetic mutation of the original pepper type, lacking a certain gene that causes the usual hotness. Even so, across both “hot“ and “sweet“ types, there is a broad spectrum of hotness. Capsicum baccatum is termed Aji throughout South America. The pods have a distinctive fruity flavor, and can be used fresh in salsas or dried and ground into powders. Capsicum frutescens includes the Tabasco plant, which is famously used in hot sauces and salsas. Capsicum pubescens originated in Bolivia; the common name in South America is rocoto. It is grown in the high-mountain areas of tropical countries and can be stuffed or eaten fresh in salsas. All bell peppers are “sweet“ peppers, but not all sweet peppers are bells: there are scads of sweet pepper types that do not have the characteristic, blocky, lobed bell shape. 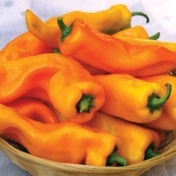 Most notable are what are usually called “frying peppers“, including some of the best sweet peppers there are. Looking beyond simple consumer familiarity (or lack of it) with sweet types, one can say that bells—which tend to be thick-walled—are chiefly useful for stuffing, whereas the usually thinner-walled fryers are for, well, pretty much any other culinary use of a sweet papper: frying (of course), salads, sandwiches, stews, you name it. It is worthwhile, at this point, to remark on pepper colors. Peppers, like many common “vegetables“, are technically fruits (hence their seed content). Not surprisingly, they achieve their best eating qualities when they are fully ripe; and when they are fully ripe, their color, for virtually all species and types, is most commonly red—or, for a few, yellow or orange. But many peppers, while yet immature, pass through other stages of color, starting with green. Yes, “green peppers“ are not some distinct type: they are simply peppers picked while still quite immature. Since the taste of a green pepper is (not surprisingly) distinctly less sweet and more bitter than that of a mature pepper (that is how the literature puts it—harsher and more acrid is probably closer to the truth), one can assume that they are a late-developed acquired taste (often thought to have been simply a growers’ marketing ploy to get peppers to market sooner). The color stages that certain cultivars pass through, and can be picked at, include (per Wikipedia, “green, red, yellow, orange and, more rarely, white, purple, blue, and brown, depending on when they are harvested and the specific cultivar.” The article goes on to add the “Green peppers are less sweet and slightly more bitter than red, yellow, or orange peppers. 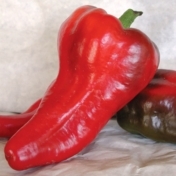 The taste of ripe peppers can also vary with growing conditions and post-harvest storage treatment; the sweetest are fruit allowed to ripen fully on the plant in full sunshine, while fruit harvested green and after-ripened in storage are less sweet.” For quite a while, most of the exotic-colored types were only available to home gardeners as hybrids, but there are now OP versions in pretty much all possible colors. Perhaps such a spectrum is visually appealing in a salad. But if we want optimum eating, it is wise to avoid any peppers other than red, yellow, and orange types (normally only bells come in any other colors, anyway); purples and browns are almost invariably still not fully ripe. Mind, if you have a definite hankering for the special acridity of green peppers for some particular purpose, fine, grow some; but if you just want peppers for general good eating, well, now you know the drill. As noted above, most sweet peppers that are not bell types are generically referred to as “frying peppers“; these usually have a long, fairly thin appearance, and (again, as noted) thinner walls and more sweetness. (And are, like bells, almost all red, with a few orange or yellow.) They are probably the best choice for any culinary purpose other than stuffing requiring a sweet pepper. In many cases, the skin is thin enough that they do not need peeling (as bells sometimes do, depending on the exact application). Note that not a few home gardeners who grow lots of fryers don’t even bother to grow bell types at all. After some seasons in “stamp-collector mode“ as to colored “bell“ sweet types, we have (we feel) regained our sanity, and will be growing a red bell (the natural color of a ripe pepper), with maybe also a yellow or orange type. We have tried to search out the best-tasting really early varities of each, and show the results farther below. Growing peppers where we are is easy; getting peppers grown here to ripen on the vine is, well, not easy. If we want green peppers, the garden cart can scarcely hold them, but nice, sweet, red (or yellow)—well, much care in selection is needed. What we have found that seems very well adapted to our short-season/hot-summer climate is a pair of delicious frying peppers of the Corno di Toro (“bull’s horn”) type: the red Italian Sweet and the matching yellow Gatherer’s Gold, and we recommend those to all who do not have extravagantly long growing seasons—and even to those who do. (Note that “Italian Sweet” is often used as a generic description; we mean the pepper actually so named, as available from, for example, Territorial Seeds). The cultivar selections were influenced by both reported flavor and earliness, since especially for coloring up beyond green, very early-maturing types are essential in a short-season climate. Regrettably, claims are many while assured facts are few. As a simple but expressive example, various seedmen’s quoted days for the common, popular Golden Cal Wonder bell pepper were 68-78, 75, 72, 75-80, 60 green & 78 yellow, 78, 78, and 62-73 (in the order we found the vendors). Note that only one had the decency to distinguish between “ready but green“ and “fully mature“ times. Our sense of it is that if you see “days to harvest“ in the 60s, much less the 50s, they’re invariably talking about “pickable but green“, not fully ripe and colored-up times. The bells list below is based on extensive literature review, not personal experience (because, shame on us, we have been using hybrid types). These three are all open-pollinated, reported to be quite early, and seem to be the, or among the, best-tasting of their sort. red: King of the North. If you commonly experience disease problems, notably Cucumber Mosaic Virus, in your peppers, an good alternative would be Peacework, of which King is one of the two ancestors. King is listed as about 57 days to green (from transplant) and 68 to 70 days to maturity. yellow: Sun Bright (also as “Sunbright”) - said to be productive, with large fruit; 70 to 75 days quoted. There are countless other types; while these seem—from the literature—as good as it gets, don’t hesitate to try others you may find—but always with a keen eye on their listed growth period (check several sources, preferably some other than sellers). As anyone who has ever taken even the most casual glance at the literature knows, hot peppers are not a vegetable, they are a religion. Here, even more than ever, the observation about taste being a highly personal matter must govern any remarks. That acknowledged, hot peppers strike us as being analogous to roller coasters: most people do the thing not for the enjoyment but to prove something to somebody—perhaps themselves. Pepper heat is commonly measured in so-called “Scoville Heat Units“, which are nowadays measured by a procedure called High-Performance Liquid Chromatography (HPLC): the chile pods to be tested are dried and ground up, then the chemicals responsible for the pungency are extracted and the extract injected into the HPLC device for analysis. The scale ranges from zero to many millions of Scoville Heat Units (with the “Carolina Reaper“ currently being the hottest pepper ever measured, at 2,200,000—beyond that are chemical extracts). One thing we find tending to confirm our opinion is that virtually all the articles one turns up in web searches for “hot peppers“ and “taste or flavor“ invariably discuss almost nothing but the hotness of the chiles, not their actual flavor (which is a shame, because the flavor is the point, not the heat). Here we’re going to send a lot of chileheads postal. It is our position that flavor and hotness are separable qualities. There are available countless bottled hot sauces, starting with the famous Tabasco brand, covering all ranges of hotness. It is our position that when you want to cook something with pepper flavors and want it to have some spice heat, you use peppers with flavor but not cataclysmic levels of hotness, then determine for yourself the hotness of the end product by the type and amount of bottled hot sauce you add, during the cooking or as a condiment at table. 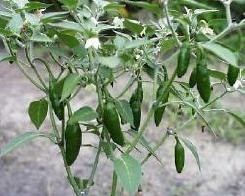 TAM Jalapeño - a mild form of Jalapeño, maybe one-half to one-fourth the heat; 70 days. Habanada - a very mild form of Habañero, (even the seeds are sweet and add to the flavor); 100 days, so probably needs to be container-grown indoors. Sweet Datil - a very mild form of the famous Datil; small fruits; 90 days, so might need to be container-grown indoors. Anaheim - as green fruits turn red, the flavor moves from grassy, earthy notes to a sweeter, more complex flavor enhanced by roasting; excellent for Chile Relleno; 80 days. Ancho/Poblano - Called Poblano when fresh, Ancho when dried; red fruits are much hotter and flavorful than earlier green ones; can get 6' tall, wants staking; 68 days green, 75 days deep red. Hot Portugal - if you want to try a fairly hot (but not Atomic) early pepper, this is one; 70 - 80 days. We have also thought much about growing one or two pepper types for home-making paprika, but—after extensive reading—decided that if one wants the real thing, one must just buy good imported Hungarian paprika from a reliable supplier (Penzey’s, for example). As always with heat-lovers in this climate, choosing the right planting-out time is critical to success. Peppers can take 80 to 90 days from transplanting to fully ripen (many gardeners pick bell types while they are still green, at perhaps 60 days, but well-ripened ones—colored up—are distinctly sweeter and better-tasting), and they grow little if at all at temperatures below 50° F. (and are generally held to not take at all to frost, though a few sources say they can stand a very light one). If we reckon—because we have chosen early types—some 74 days for the from-transplant growing time, we want to set our transplants out 37 days from the season mid-point, which hereabouts comes around July 22nd. That calculates out to June 15th or thereabouts, and means a harvest date somewhere around August 28th, which is about right because we usually stay warm even into the first week or two of September, in case they need a little more time to finish coloring up. Pepper seedlings take a long time in the pot before transplant: sources typically say things like “eight to ten weeks or more“. If we use good-size peat pots and go 10 weeks, that takes us back to about April 1st as when we should be sowing our pepper seedlings—though the conservative, which includes us, might want to make it mid-March to give them a full 12 weeks in pot (so use large pots!). Peppers, like all heat-loving plants we grow in this climate, need to be started indoors and later transplanted out. The seeds germinate optimally at about 85° F., so heat pads are close to mandatory, as germination is much slower at lower temperatures, and will scarcely proceed at all below about 65° F.
Many people start seedlings in trays, but we like to set them in the pots they’ll be transplanted out in (which are peat pots—at least one grower was emphatic in advising gardeners not to use peat pellets for peppers (but pots are OK). And, since we’ll be keeping them long to plant out hearty, use 4" pots, not the little 2" ones. Grow the seedlings at, ideally, 70° in the daytime and 60° at night, providing plenty of sunlight or artificial growing light. It might be wise to plant a few extra of each pepper type wanted, then cull for vigorous, stocky plants (as opposed to thin, tall, spindly ones) at transplant time. It is quite important that you annually rotate your Solanaceae crops: don’t grow peppers on soil where any Solanaceae—peppers themselves, tomatoes, potatoes, tomatillos, eggplants—have been grown in any of the three prior seasons. Ignoring that rule can, as with cole crops, cause the buildup in the soil of pests and diseases that, once established, are exceedingly difficult to get rid of. The outdoors pepper bed should, of course, be in a full-sun location. Peppers want well-drained soil, preferably a light, sandy loam that is slightly acid—say pH 6.3—though that is not crucial. They do, like tomatoes, want rich soil, and especially like a strong phosphorus content in the soil. It is close to mandatory in this climate to use plastic mulch (set out a couple of weeks before the anticipated transplant date); and, because peppers, like tomatoes, abhor wet leaves, a drip watering system is also a wise investment. With peppers as with tomatoes, the new red-colored plastic mulches are said to have a definite beneficial effect on production compared to the old standard black plastic. As your planned transplant date approaches, check the soil temperature: it should be at least 65° F, and if it isn’t, hold off till it is (an extra week or two in pots won’t hurt the seedlings). Pepper plants can, at least in a deep or raised bed, be spaced as close as 12 inches. It doesn’t hurt, and may help, to provide them with some caging; for these, as opposed to tomatoes, the usual store-bought inverted-cone type things are probably adequate, as most peppers don’t get anything like the size of a tomato plant. Several sources suggest transplanting out in the evening or on a cloudy day, so as to reduce the chance of the transplants getting sunscald. Pepper plants require continuous growth for satisfactory results: frequent, regular, slow, deep watering works best, preferably by drip irrigation (especially because it is unwise to get their leaves wet). Cool weather can keep plants from flowering, which is why all the heat-gathering and heat-preserving methods mentioned above are wise. Nonetheless, it can also get too hot for peppers: if the temperature under row cover or a cloche (or within a wall o’water) gets over 85°, it is advisable to remove the row cover of cloche or whatever till the temperature drops into the low 80s. If you have plastic or other mulch, weeds are no problem—otherwise, cultivate well but very carefully, not below an inch deep at most, because if you cut roots, that may well cause water stress on the plant, which will lead in turn to blossom drop (as can even a short dry period, hence the need for frequent, regular watering). If your plants don’t look robust, or are only a light or pale green, they may be hungry: apply about a tablespoonful of nitrate fertilizer around each plant, after several blossoms have set. But don’t fertilize blindly—if your plants look healthy enough, let them be, lest they ignore fruiting for vegetative growth. Bell peppers typically produce 7 to 10 peppers a plant, hot peppers more. When to harvest is an interesting question. On the one hand, leaving peppers on the vine till they’re completely ripe somewhat reduces the total productivity of the plant; on the other hand, immature peppers are notably less sweet. To us, the choice is clear: let them ripen on the vine. We’re not commercial growers: if we want more peppers than our plants produce with the fruits left to fully ripen, we’ll grow more plants next season. By report, with bell peppers if you allow the first fruits to mature (to red or orange or yellow, depending upon the variety), they tend to shut down fruit production. Non-bell sweet types do not seem to have that problem, being able to put out new fruit with mature ones still on the plant. It thus behooves one to take care with harvesting bells. Peppers are usually picked when they’ve stopped increasing in size, are firm to the touch, and have reached their expected color. Don’t pull peppers, because the plant’s branches are rather brittle and you can break them that way: harvest by cutting the peppers off. As the peppers near maturity, inspect your plants daily and harvest what’s ready. The peppers, all kinds, belong to the sun-loving Solanaceae family, along with tomatoes, tomatillos, potatoes, eggplants—and the deadly nightshade. The pungency of peppers depends on the presence of a single gene: cultivars lacking that gene are “sweet“ peppers, those with it are “hot“. Our present taxonomy of peppers is rather a muddle, and the speciation described earlier will likely change in coming years as research advances. There is a good on-line summary of pepper taxonomy available for the curious. Most experts agree that the wild ancestors of modern peppers first arose in the Amazon basin. Pepper seeds, carried by Amazon and later by Aztec Indians, were then spread throughout South and Central America and north into Mexico. Peppers were bing actively cultivated at least as far back as 6,000 years ago. The European arrival in the Americas soon brought peppers to Europe; not long thereafter, Portuguese traders brought them to India and south-east Asia, in whose cuisines they are now a long-established staple. Thailanders consume more hot peppers per capita than any other people on Earth, about twice as much as the people of India; the Korean people are a fairly close second to the Thais. Those interested in getting more detail on how and why hot peppers do what they do on the human palate and in the human gut can visit this site about The Chemistry of Chilli Peppers. It was last modified on Saturday, 2 February 2019, at 05:19 EST.